Samsung Galaxy S6 vs LG G3Â comparison:-The Galaxy S6Â has launchedÂ and itâ€™s arguably Samsungâ€™s most important phone ever. With sales of the S5 less than stellar, the pressure is on the S6 to restore Samsungâ€™s reputation. That wonâ€™t be easy with rivals such as LGâ€™s excellent G3.The Samsung Galaxy S6 has been announced, and will hit shops on April 10.Lets have a comparable look below in details Samsung Galaxy S6 vs LG G3Â Â comparison,Â specifications, price, comparison and pros and cons. The Samsung Galaxy S6 reveals that Samsung has gone for more a premium and elegant feel than the S5. It has a glass front and back on both sides, withÂ a metal frame, and while the bottom of it really looks like an iPhone, the rest of the design looks pretty much like any other Galaxy so far. The LG G3 is a beautiful device, with a great screen-to-body ratio, but the brushed-metal effect plastic feels cheaper than the glass behind of the S6. The LG G3’s design isn’tÂ bad by any means, but Samsung has really upped the ante with its S6.With the Samsung youâ€™ll be looking at a 5.1-inch QHD display delivering 2560 x 1440 resolution. This is the same resolution as the LG G3 but in a smaller frame, with the G3 display stretching to 5.5-inches. Thereâ€™s no doubt that the screens in both phones look fantastic, and which you prefer will depend on your own tastes. The LG G3 display is bigger, but Samsung’s Super AMOLED display hasÂ superior brightness,Â contrast and pixel density. The Samsung Galaxy S6 boosts Samsungâ€™s own Exynos 7 series processor, which is an eight-core, 64-bit chipset. The LG runs on a Snapdragon 801 with four cores clocked at 2.5 GHz. The Samsung has 3 GB of RAM and the LG G3 hasÂ 2 GB or 3 GB depending on which model you buy accordingly. Galaxy S6 chipset is even more powerful thanÂ Qualcomm’s Snapdragon 810 processor, which in turn isÂ a serious step up from the Snapdragon 801 powering the G3. Because of this, performance-wise, the Galaxy S6 is technically far superior. The Galaxy S6’s rear camera is a massive 20 MP snapper with optical image stabilization, while the front camera is 5 MP. Like the quality found in Samsung’s display, the Galaxy S6 camera is a real beauty, and probably the best on Android. Check its low-light capabilities in our Galaxy S6 vs iPhone 6 camera comparison. The LG G3 rear camera is 13 MP with OIS, and the front one is 2.1 MP. It’s a fast and accurate performer – with record-breaking auto-focus speeds.So in terms of camera,Samsung Galaxy S6 really is a world beater. The Samsung Galaxy S6 has a 2,550 mAh battery. It sounds small – and itâ€™s smaller than the one in the S5 (2800 mAh) – but apparently Samsung has optimized its 64-bit processors to the point that the smaller battery should deliver the same battery life. The Galaxy S6 can also charge wirelessly, and is said to add 4 hours of battery life in just a 10 minute (wired) charge. Weâ€™re keeping our fingers crossed on that one, but we won’t know how it performs for sure until our final review. The LG G3’s battery is larger at 3000 mAh, and it’s a strong performer, given the QHD screen it powers. The elusive “two-day” benchmark is definitely achievable with the G3, and it sits in our best Android smartphone battery list. LG’s battery might last longer than the Galaxy S6 in a straight head-to-head, but it will be interesting to see if Samsung’s quick-charge claims hold up when tested fully. The LG G3 comes inÂ 16 GB and 32 GB variants, both of which haveÂ the ability to expand via microSD cards. TheÂ Galaxy S6 comes in 32 GB, 64 GB and 128 GB variants, but there is no microSD card support. With 128GB microSD cards being commonplace these days, you can expand your LG G3’s storage capacity to outdo even the pricey 128GB Galaxy S6. Samsung takes back that lead in connectivity.Both are 4G phones, with theLG supporting more bands for roaming but the Note 4 theoretically faster with Cat 6 (up to 300Mb/s) rather than Cat 4 (up to 150Mb/s) 4G. The pair also support 802.11ac Wi-Fi (2×2 MIMO for Samsung), Bluetooth 4.0 (4.1 for the Note 4) and GPS. TheLG adds MHL, an IR blaster and Samsung’s Download Booster, which combines the power of 4G and Wi-Fi for faster downloads. Both these smartphones have fingerprint scanners, but only the Samsung is sold with a built-in heart-rate monitor and UV sensor, and comes with an S Pen stylus. 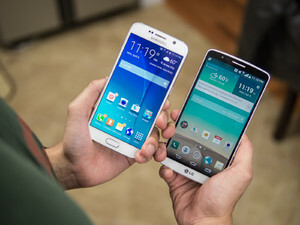 Conclusion whether which one is the best:Samsung Galaxy S6 or the LG G3. We obviously can’t say anything yet.The truth is that that Samsung Galaxy S series and the LG series haven’t had all that much in common in recent years, but now Samsung appears to be targeting the one area of other smartphones. With a metal chassis and divisive touches like the lack of microSD support and waterproofing, not to mention a non-removable battery, the Galaxy S6 design is closer to the iPhone. The LG G3 starts at 385 USD for the 16 GB carrier-unlocked version. We don’t know the official Galaxy S6 US pricing details yet, but in Europe it will be 699 euros for 32 GB, 799 euros for 64 GB, and 899 euros for 128 GB.